Karen’s book, Being an Elder, Becoming a Treasure, captures the energy Karen brings to the world with her speaking and consulting. Her stories and insights about being an Elder inspire all of us to meet the challenge of the title of becoming a treasure. Being an Elder is for anyone who has wisdom to share or who wants to help their Elders share more. Reading this book is very similar to being an Elder. The process is learn, reflect, change, and share. Journaling with reflective questions is one of the simple ways to capture treasures found along life’s journey. Take advantage of the activities in the book to apply the insights and lessons to your life. Being an Elder entertains with stories from Karen Lund’s life and world travels. Then it provides activities for fusing insights into actions. 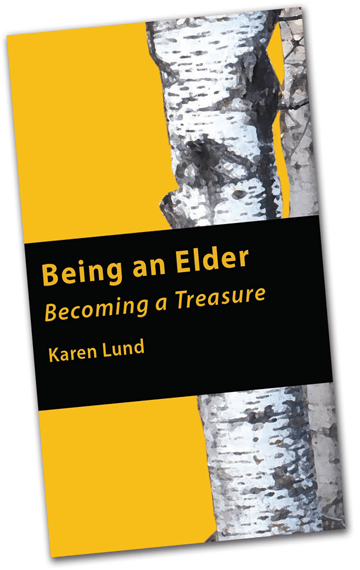 Follow Karen Lund, on the journey of Being an Elder to discover yourself and your unique contribution to family, community, and the world. Karen Lund, is not only an author she is also a global business consultant, an Elder, a jet setter, a storyteller, a physical education teacher, and was a Red Cross staffer during Vietnam. She fused her 50 years of listening, talking, observing and analyzing organizations, communities and individuals into the many insights in Being an Elder.